The study is the first of its kind in the region. It looked at and provided recommendations for political participation, civic involvement, engagement and empowerment in Travis, Williamson, Hays, Bastrop, Caldwell and Burnet counties. The report was prepared by the RGK Center for Philanthropy and Community Service, The Annette Strauss Institute for Civic Life at the University of Texas and the National Conference on Citizenship. 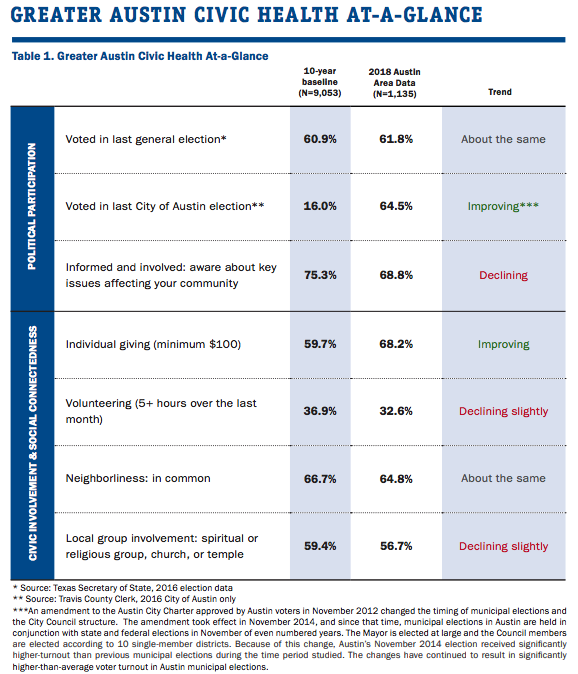 The index found that Greater Austin area residents turn out to vote more than any other region in the state and vote in relatively high numbers in local elections. About 59 percent of residents in the six surveyed counties reported voting in their most recent local election. The report also found that 69 percent of residents were aware of key issues affecting the community. Those who were older, more educated and had higher incomes were more informed. That percentage has been declining over the last 10 years. Susan Nold, the director of the Annette Strauss Institute for Civic Life, said the community has to work to improve voter turnout among young people. More than two-thirds of the Greater Austin community reported giving $100 or more to local charities, and rural areas transitioning into suburban areas saw the largest donation increase. Although donations were up, all counties saw a decline in the number of foundations in 2011 after the recession. The index also measured social connectedness in the area. Neighborliness has stayed consistent over the past 10 years. According to the report, about 65 percent of residents feel that they have things in common with their neighbors. Nold says the aim of the report is to “spark conversations that citizens can have with each other," leaders and businesses. KUT provided financial support for this report.